This entry was posted on May 4, 2014. Bookmark the permalink. Our summer youth mission trip, “Mission Possible” is embarking this June 2014 for a wonderful week of praise, worship andmission projects. Our group comprises 110 missionaries, youth and their adult mentors, from all walks of life, representing 9 different churches, who wish to travel together to bring the light of Christ to our hurting brothers and sisters in the Caribbean. Our itinerary includes stops in Belize, Grand Cayman, Cozumel and Roatan, Honduras. Our church, Wesley United Methodist Church, will be a major part of this exciting venture as we serve as the coordinators for the Roatan project, “Reach out to Roatan”. Roatan, Honduras is a small island in the Caribbean, which is only 48 miles long and 5 miles wide. The population is 50,000 (which has tripled in the past 20 years), most islanders with a mixed heritage of European, Caribbean, Latino and African descent. Honduras is the second poorest country in Central America; most of its citizens live off about $1 per day. In the last 20 years, tourism has replaced fishing as the main economy but the local people rarely see any of the income generated because most of the resorts are owned by wealthy foreigners. The huge influx of foreign visitors has facilitated a subculture of drugs and prostitution that leaves the youth of Roatan sick, depressed and mired in poverty. Bring gifts of cleats, shin guards and socks for the boys there as well as small “Beanie Baby” or other stuffed toys for the girls of Roatan Mission. Share an island feast of “Celebration Chicken” with the VBS children and their families, a true blessing for the people there who only enjoy a meat dish on special occasions like weddings or big events. Conduct a mass screening for diabetes and high blood pressure, diseases which are endemic to the population of Roatan but often go undiagnosed due to a shortage of health care providers in their rural population. We will bring diabetes starter kits for the most severe cases and provide referrals to the clinic on the other side of the island for long-term follow up. Send an adult team to minister to a group of island people who live and scavenge atop the local dump. We will bring food and gifts to them and minister in the name of the Lord. We cannot do this alone!! We are reaching out to our local community here in Union City and Randolph County, Indiana and asking for help in this amazing project. Would you please pray for our projects? 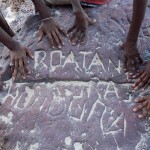 And prayerfully consider making a donation to “Reach out to Roatan”? If we are to build all 24 goals, we need to raise $11,000, the majority of which will go to pay for the steel pipe with which to construct the soccer goals. We have already raised $4000 within our church but we need your help to reach our goal!! In addition, we hope to collect 150 sets of soccer footwear (plastic-bottomed cleats, shin guards and socks) for the boys as well as 150 “Beanie Baby” or similar stuffed toys for the girls of Roatan Mission. These items can be new or gently used, clean and in good condition. Please mark “Mission Project Honduras” on the memo line. Footwear (cleats, shin guards, and socks) as well as “Beanie Baby” or similar stuffed toys can be dropped off at Wesley UMC on Tuesdays-Fridays and Sundays from 9am to 12pm or during regular business hours at the Christian Bookstore, 232 N. Columbia St., Union City, Indiana or at North Side Elementary School 905 N. Plum St., Union City, Indiana. Please contact Teri Sowinski at 765-964-5766 (home) or 937-459-8848 (cell) if you have any questions or need any assistance in making a donation. THANK YOU FOR PARTNERING WITH US TO SHARE THE GOOD NEWS!! !